Umberto Eco, who gained international fame for his novel The Name of the Rose, passed away on Friday. He was 84. 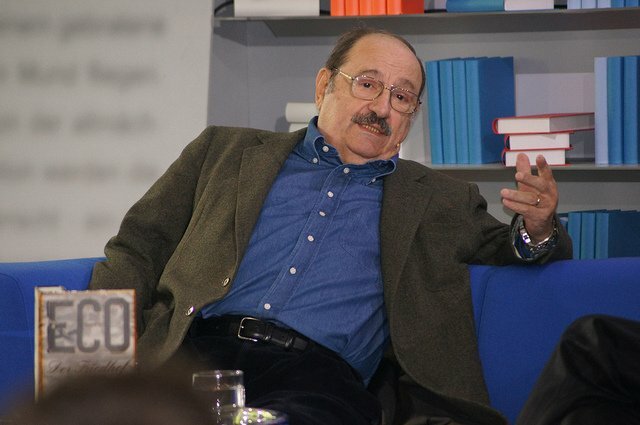 Umberto Eco in 2011 – Photo credit: Das Blaue Sofa / Club Bertelsmann. If I had to explain it, I would say that it’s because the period is exactly the opposite of the way people imagine it. To me, they were not the Dark Ages. They were a luminous time, the fertile soil out of which would spring the Renaissance. A period of chaotic and effervescent transition—the birth of the modern city, of the banking system, of the university, of our modern idea of Europe, with its languages, nations, and cultures. Eco would continue his academic career in Italy, and in 1959 published Sviluppo dell’estetica medievale (this would be translated into English in 1985 under the title Art and Beauty in the Middle Ages), which summarized his views on medieval aesthetic ideas. His academic career continued to flourish as he took on numerous other subjects, including media studies, semiotics and anthropology. He would also teach at Columbia University and Harvard University, before retiring as professor emeritus at the University of Bologna in 2008. Eco would go on to write several more novels, most of which were set in past historical periods. His novel, Baudolino, published in 2000, gives us the story of a 13th-century knight who meets the Byzantine historian Niketas Choniates and tells him his life-story. The account he offers is full of wild events and strange lands, leaving the reader to debate how much of it could be true. We will have a full piece about Umberto Eco and his contribution to medieval studies in the upcoming issue of our magazine.